In a world of hyper connectivity, having customized content pushed to us on our mobile devices, tablets, and wherever we access the internet is just part of our daily lives. Devices formerly considered low-tech like refrigerators can now interact with us by providing customizable apps for grocery lists, managing our calendars, and checking the weather forecast. Still, even with the advent of smart TVs and thermostats, there were some items in our lives that we figured would never connect to the internet or serve as a tool for marketing messages. An UK-based company EVRYTHNG has the technology to change all the rules of marketing communications once again. 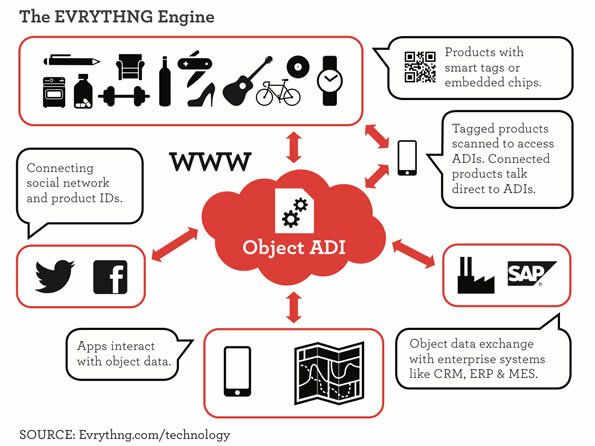 With their application, consumers can create a web profile or Active Digital IdentityTM for ANY physical object. Why is this development important to marketers? It provides another opportunity to create customer loyalty and build brand relationships. Your bicycle can have its own profile on Facebook and connect with other products. Your camera can tell you where to go for the best photo opportunities. And your medication can tell you when it’s time for a dose. While this new level of connectivity may be too intrusive for some, for companies and their customers, it allows for a stronger bond.